Dare to Relax Lodge is the culmination of a 4 year custom design and build of truly unique log home perched on a 9 acre estate overlooking a 20 foot wide rushing stream in the serene and picturesque mountains of North Georgia. Completed in 2016, the lodge is located just 75 miles north of Atlanta yet with a feeling of being lost in the wilderness. Dare to Relax Lodge features a large vaulted great room with an exposed log structure and an open Kitchen and Dining Room creating a dramatic interior inspired by the Grand Tetons located near Yellowstone National Park. Hand peeled logs approaching 2 feet in diameter with Swedish coping and saddle notch accents throughout recreate the grandeur of National Park Lodges. The great room features a 30-foot wide wall of glass that sours 24 feet tall offering a dramatic view of the stream below and features a large wood burning fireplace set in real stacked stone masonry. The connected dining room features a custom designed dining table that seats 13 guests. The kitchen which is open to the great room features dual cooktops and convection ovens along with an oversized island with copper farm sink. No expense was spared in the chef’s kitchen with custom walnut cabinets and granite countertops. The Aspen Ski themed master bedroom features a custom king log bed along with a daybed set in a bay of windows. The master bath features dual copper basin sinks and oversized natural slate stone shower. Equipped with a 40” HDTV, the master is a sanctuary on its own. A 2nd bedroom on the first floor has a queen bed and an adjacent full bath. Upstairs there is a 3rd bedroom with a queen bed. Also on the second floor is an oversized bedroom that sleeps 8 with a king bed and a set of custom log bunk beds (2 double beds and 2 twin beds). The large back porch off the main living area is a favorite spot for relaxing to the sounds of the stream with a bed swing (a favorite napping location), outdoor seating and dining table. Off the basement is nice sized lawn with corn hole games provided. There is also a patio with six log rocking chairs along with a 7-person hot tub. Just off the lawn area is a stone fire pit surrounded by large boulders. Off the front of the house is an outdoor covered seating area surrounding a gas fire pit. Finally, there is an outside dining table and ceramic egg grill/smoker. We offer free extended satellite TV service and free high speed wireless internet, and board games for family fun. Dare to Relax lodge is easy to get to via paved roads. This home is located in Talking Rock Creek Resort, a premier mountain resort community in the north Georgia Mountains, one and a half hours from downtown Atlanta, GA and about 25 minutes southeast of Ellijay, GA. The resort community is a secure gated community nestled below Carters Lake and alongside Talking Rock Creek, a premier trout and fly-fishing stream. The resort encompasses over 5,000 acres of secluded mountain territory and is filled with creek front, forest and mountain view homes and sites. With a Rec Center, 2 pools, tennis and basketball courts a Trout Lodge with riverfront access and a large fishing pond, Talking Rock Creek has all the natural amenities within minutes of your property. Read more details about all the resort amenities here: Talking Rock Creek Resort info. •	Recreation Center with additional Pool and tennis courts. The cabin high quality, abundant standard kitchenware (pots and pans, dishware, cutlery, glassware, serving ware, utensils), bed and bath linens (sheets, pillows, bedding, blankets, bath towels, hand towels, wash cloths) to support the full occupancy. We also supply septic safe toilet paper. •	Also consider bringing additional hair dryers, bug repellant, sun screen, flashlights. My bride of 27 years and I are natives of the Atlanta area. We have amazing twin daughters who are seniors in college along with an incredible church family. We built Dare to Relax to share with others. I was the architect, builder and designer of the log home. We built the home with two objectives in mind, first we wanted a place that would reflect the majesty of God. Second, we wanted a home that could accommodate large crowds with many spaces for conversation and community. We also wanted a home that while large in space and scale would also feel intimate for couples or smaller parties. 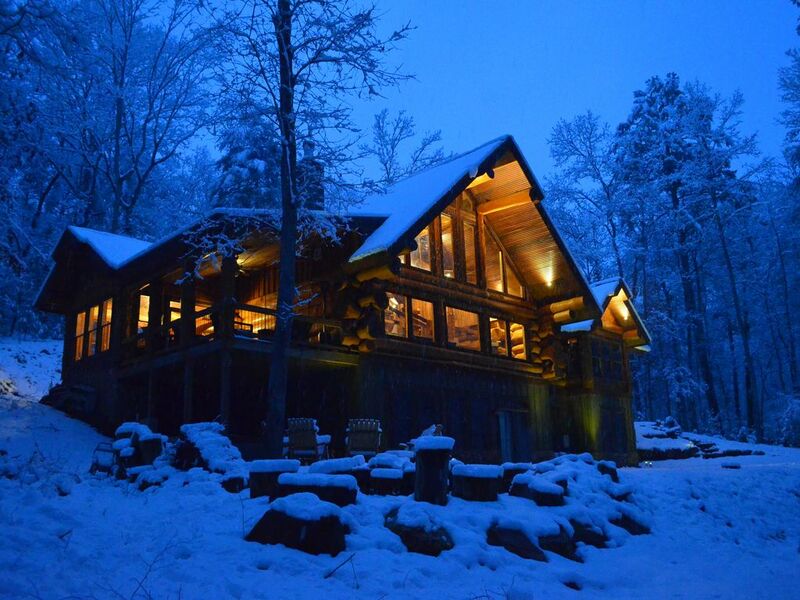 Dare to Relax Lodge is like no other log home you have ever seen. Some of the logs are almost 3 foot in diameter. Most everything in home is one-of-kind. Guests remark that after days of staying at the lodge they continue to discover features and details they hadn't previously noted. The beams used for the pot rack and kitchen hood came from a barn constructed in 1800. The 7-foot dining table is constructed from timbers from a previous south Carolina cotton mill. Every log in the home was hand peeled and sculptured to perfectly fit together in a true work of art. While rustic, the home is filled with luxury. There is an Alexa to play music at the command of your voice. There is HD movie theater room. Every bedroom has an independent sophisticated AC and heating system to allow each guest to set to the room temperature to their personal preference. Our families enjoy every minute... the cabin is perfect for all ..kids and adults ..many things to do and enjoy the place at full..well equipped cabin with all luxury and the place safe and enjoyable to explore...thank again for everything .. Owner help a lot with any questions..
Our family (eight) recently spent the week of Christmas at Dare to Relax and had a thoroughly enjoyable experience. We have stayed at many VRBOs, around the world, and I would describe this experience as almost qualitatively different. This is not a rental set up as an income property. Rather, this is a house that was built for a family to live in. The construction is obviously unique, but the attention to detail in both its building and furnishing is what distinguishes this property from so many others. Each and every room has its own story... its own unique qualities and character. You can literally spend days just exploring the house. Inside, the home is extremely well appointed and equipped. We did a full Christmas dinner - turkey and all the fixings - complete with crystal, china and silver (obviously we brought these ourselves...); everything we needed to prepare that meal was on hand. Beds and linens are comfortable and in great condition. The furniture is not at all what you would typically find in a rental, but the kind of furniture you would have in your own home - we may, in fact, add some of the pieces to our own home. The basement entertainment area is a whole other universe... the arcade games were a huge hit with the whole family, including our five year-old grandson, who never once in a week missed his "electronics". The large projection TV is a great one, and was a big hit with the sports fans in the family. Both inside and out, the home has been carefully built with an extraordinary number of sitting/gathering places. Everywhere are carefully crafted nooks and crannies with a table and chairs for people to sit and talk, in small groups or large. This is another feature we found incredibly welcoming. The outside spaces are as spectacular as the indoor. The stream, the hills and the neighborhood dog (an incredibly friendly young lab) ensured that we spent most of our time exploring and sitting around the fire pit. We arranged to have wood delivered ahead of time, and enjoyed a number of fires both inside and out. But the most important feature of the property is Alan himself, who was available day and night - not just to answer questions, but offer suggestions and ideas. Alan truly cares about both the property and his guests, and was a huge plus. I am sure I will stay in touch with Alan going forward. As advertised! All three floors of this cabin in the wooded foothills of north Georgia were clean and inviting. The owner was in regular contact both before and during our stay to ensure our family gathering would be enjoyable and memorable. The small stream near the cabin was fun to explore. There were plenty of nooks in the cabin to hang out in, so it never felt crowded, even for our large group of 14. We took advantage of nearby attractions for interesting day trips: a festival at Fainting Goat Winery, Amicalola Falls, and the beautiful small town of Blue Ridge. This rental is highly recommended for a quiet getaway. Wow!!! That was our first impression upon viewing Dare to Relax Lodge in person. The pictures just don’t do it justice when it comes to the massive size of the entrance nor how awesome the interior is. Alan did a fantastic job of capturing the feel of being in a high end mountain lodge and didn’t cut any corners for carrying that feel throughout the home. Our family was amazed at all the details around every corner that brought the mountain feel indoors and the view from the windows of the mountains and trees and the running stream added to that ambience. Our week went far too fast and we all felt we needed another week to fully enjoy everything the home and area had to offer. We loved everything about this vacation home from its peaceful atmosphere within, to the tranquil setting outside, to the amenities in the home and resort itself, to the variety of activities in the area, and of course the entertaining neighborhood dog, Jazz, who kept our grandkids busy. And of course we can’t say enough good things about the owner who was a wonderful host and who was so easy to work with and so accommodating. We enjoyed hearing about the building and purpose of the home, which made us feel like we were part of the home too. And now Dare to Relax Lodge has become a part of our family as well as we will always fondly remember our stay in the Georgia mountains. This awesome home and the hospitality of the owner is now a part of our wonderful vacation memories and will be talked about for years to come, especially now that is has become our favorite vacation home that we have stayed at so far. Thank you for blessing us by sharing your home with us. We have just returned from a fantastic family vacation at Dare To Relax. Our family of six adults and 6 teenagers were greeted at the cabin by Alan, the owner. He was very helpful in assisting with our reservation, even texting us while he was on a mission trip to Russia and with showing us the cabin. This place is so spacious and comfortable. This was the first time all 12 of us could eat at one table! Plenty of comfortable beds, well stocked kitchen with a large pantry for our food and enough supplied bathrooms for our crowd. The teenagers occupied their time in the awesome game room and theatre room. We also made use of the community pools and basketball courts. Played corn hole and enjoyed the mountain stream. Also made trips outside the resort to take in Carter Lake and Amicalola Falls. I would surely rate this a five star cabin. Don’t think we will ever be able to top this stay!! This cabin has it all. Thanks to Alan for sharing his home with us. Morning Coffee, birds singing and creek flowing !! My husband and I stayed at the Cabin May 18th thru May 25th. We returned June 22nd thru June 29th with our 3 daughters, their husbands and our 6 grandbabies. Alan is the best host, meeting us at the cabin showing us around. Cabin was beautiful and spotless. Our family had the best time playing in the creek, (with Jazz) swimming and tubing in the creek near the lodge, smores and of coarse the game room. One of our son in laws was proud to get the second high score on the pinball. Some of the family visited Tellus Science Museum and really enjoyed it. We Celebrated one of our grandkids birthdays at the bowling alley in Canton. They bowled and played laser tag. It was very nice and everyone was very helpful. There were 13 of us and there was plenty of room. Nothing was better then sitting on the back porch drinking your morning coffee, listening to the creek flowing and the birds singing. Bring dog treats for the local mountain dog Jazz. She played with our little ones everyday, even brought her own tennis balls. She was great with all the kids and loved playing fetch. And loves the creek. A lot of the family went fishing in the large pond where you take your trash. Some caught fish, and they were released. The big dining table was great for eating , playing games (the grandkids favorite is bingo, cause Meme brings prices)and crafts. We did put together a scavenger hunt for the grandkids. There is so many cool things in the cabin. We have already recommended the cabin to many friends. Alan even checked on us during the week, making sure everything was good. We live in Florida and have been coming to the mountains over 20 years with are family staying in cabins. We have never had a owner be so nice and go the extra mile to make sure our visit was good. Thank you Alan. We hope God blesses you and your family. We will return !!!!! !